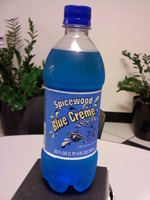 This next beverage comes from a co-worker of ours; it is one Spicewood Blue Crème Soda.Now I’ve never tried a blue crème soda before.Red, yes.Sparkling, yes.Blue, no.He says he got this at a gas station near his house, so who knows... maybe it’ll be near you too.The label art really seems quite random on this bottle; nothing is quite lined up right. Three types of font are represented in the drink name alone. There’s a pitcher of, what I can only guess is, vanilla spilling out.The words “Blue Crème” are even excreting some sort of liquid as well.Just for good measure there are some random bubbles in the bottom left corner.I don’t think I need to say this, but I will just as well.This drink is artificially flavored.GASP!Let’s drink. Upon opening it I smell a very nice vanilla fragrance, kind of how red crème soda smells in comparison to a normal one.Bottoms up.My first thought while drinking this is that it’s a lot smoother than I thought it would be, surprisingly smooth even.I know that crème soda isn’t known for having a strong bite, but the fact that this was from a gas station store, is from a brand I’ve never heard of, and is blue... some part of me saw it being a bit harsher on the throat.Other than that it tastes like crème soda... I really wish there was more I could milk out of this.I don’t have an A&W cream soda nearby to compare it too, but if this is to be considered the “off brand” I’d definitely give it a try.One more thing before I give up on trying to tell you what cream/crème soda tastes like.The Spicewood Blue Crème Soda isn’t overly sweet.I mention this because a lot of people don’t like crème soda due to its overly sweet taste.While sweeter tasting than many cola’s, Spicewood Blue Crème Soda stays right where it needs to on the range o’ sweetness.